Is It Safe To Wear Makeup During Pregnancy? Do you love your makeup kit? Are you pregnant and worried that using cosmetics may harm the little one in your womb? Well, if you can relate to the above situations reading this post is a must. 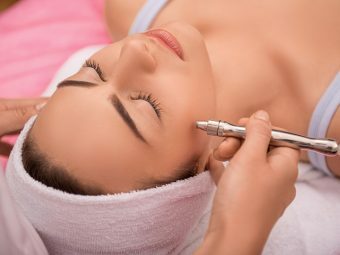 Therefore, it is natural that women resort to cosmetics, to mask these skin changes in pregnancy to look beautyful and feel better. Even otherwise, wearing makeup during pregnancy is a usual routine for most women (2). There are contradictory theories on the use of cosmetics and chemical exposure during pregnancy. Hydroquinone, a popular skin-lightening agent, does not cause any fetal malformation. 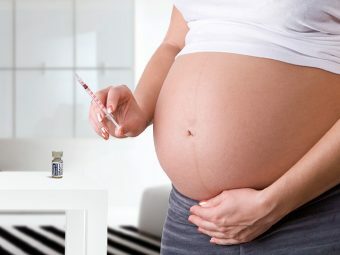 However, as it has a relatively high systemic absorption rate into the blood, it is best to minimize the exposure of the chemical during pregnancy. Can pregnant women wear makeup? Well, most cosmetics in the markets are not subject to any regulation. So the toxicity of the chemicals in cosmetics or the safety of its use while expecting is still ambiguous. For your safety in pregnancy, watch out for these ingredients in any of your cosmetic products and stay away from it. You can consult your dermatologist to suggest specific alternatives for each of them. Vitamin K: Vitamin K, is one of the major ingredients in any skin lightening cream. It also aids the clotting of blood. During pregnancy, you are prone to developing clots. Hence, it is advisable to not let the vitamin K in cosmetic products penetrate the skin and reach the bloodstream and cause fetal complications. Protect your growing fetus by limiting your exposure to chemicals like lead and mercury, especially in the first trimester. A proactive skin care regime is all that you need to keep your skin youthful and glowing, not just during pregnancy but throughout life. But for that, you need not always embrace chemicals. Go organic! Hope you liked our post on is it safe to wear makeup during pregnancy. Did you completely stop wearing makeup while pregnant? Did you find a natural style statement? Share your experience and tips with other moms here! Is It Safe To Get A Chemical Peel During Pregnancy?